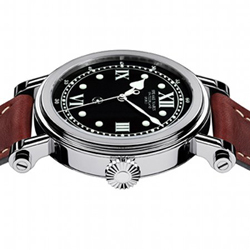 The new Mark 2 Spirit is a reinterpretation of the watch Speake-Marin Spirit appeared last year, which saw the Salon QP now exhausted its 68 parts provided, one of the new 2012 models, such as Classic HMS, always with the classic cash Piccadilly style, but thinner in size. As in the first version has remained the same message engraved on the case back “Fight, Love & Persevere”. It ‘a watch that relies entirely on the three-dimensionality of its face. Indications in white on a black mat are naturally very readable as well as indexes that are coated in Super Luminova. 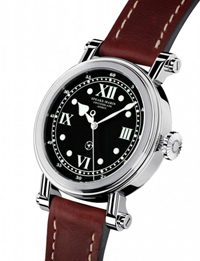 Being minimalist design of Spirit Mark 2 is very clean and a 3D effect, all the elements of graphics such as indexes and Roman numerals for the hours, Arabic numerals and minute single small are applied on different levels, the same way as the written Speake-Marin and its traditional name with the logo in the shape of the old machine that was used centuries ago by the watchmakers to supplement and modify the profile of the teeth of the wheels. Speake-Marin Spirit Mark 2 features the Calibre TT738 a new automatic movement with power reserve of 120 hours (5 days), which is equipped with a unidirectional rotor, slower – but that also keeps energy more constant. The dial of the Mark 2 Spirit is framed by a bezel whose edges are finished with perlage done by hand. According to Peter this finish enhances the casual style and contemporary for which Spirit has made himself known, as is the case in stainless steel measuring 42 mm and 12 mm in thickness is much thinner than the previous. Unlike the previous version Spirit, now the pad is full and slightly arched.